Keeping track of developments in anime can be difficult for non-Japanese audiences because new series and the like are not publicized much outside of Japan unless you specifically haunt sites that announce such things. However, it can be interesting to see what is happening with anime because it is a real peek into a different culture. If you like to travel, well, you can do the next best thing by checking in occasionally on the latest fads overseas or the new television series. No, it's not the same thing, but it does offer a window into another world. There is also that voyeuristic delight in being up-to-speed on events halfway around the world. Or, you may just be into anime. A surprising amount of Americans and others are. 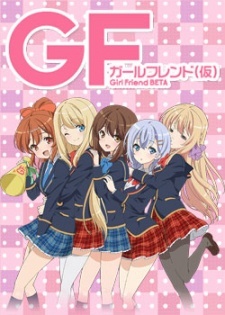 "Girl Friend" (Kari) (Girl Friend BETA) is an upcoming television anime. A special television program for the upcoming series aired on TV Tokyo on Sunday. The program previewed the animation and next week's premiere in Japan (on 12 October 2014), and confirmed that the anime will have an original story. The anime adapts CyberAgent's social romance simulation game of the same name. Naotaka Hayashi (Morita-san wa Mukuchi, Magi - The Kingdom of Magic assistant director) will direct the anime at the studio SILVER LINK (No-Rin, C³, Baka and Test). Michiko Yokote (Love Stage! !, No-Rin, Genshiken) will handle series composition. Noriko Tsutsumiya (Dragonar Academy, C³, Kokoro Connect animation director) is designing the characters based on original character designs by QP:flapper (MM!, Oreimo 2, Sora no Method). Kadokawa released the first issue of the special Girl Friend (Kari) Magazine on August 22. The magazine included four manga series that focus on specific characters from the anime. Tsukako Akina launched the Girl Friend (Kari) Kokomi Shiina manga in the September issue of Kadokawa's Dengeki Maoh magazine on July 26. CyberAgent's blogging website Ameba started service for the game for smartphones in 2012. As of June 2014, the number of registered users has passed 5.3 million. The game features over one hundred girls for the player to date, each voiced by a different voice actress.